Standard/Light. 4 spider 5 blade, ball bearing reel tempered alloy steel reel and bed knife blade. Unbreakable steel side plate. 3/4" formed torsion tube. 10" durable composite wheels with radial tread tires. 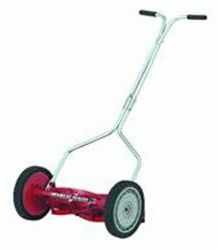 Cutting height 1/2" to 1-3/4" with adjustable 4-section roller corrosion resistant zinc-plated handle with plastic grips. 4 spider 5 blade, ball bearing reel tempered alloy steel reel and bed knife blade. 10" durable composite wheels with radial tread tires. Cutting height 1/2" to 1-3/4" with adjustable 4-section roller corrosion resistant zinc-plated handle with plastic grips. Standard/Light. 4 spider 5 blade, ball bearing reel tempered alloy steel reel and bed knife blade. Unbreakable steel side plate. 3/4" formed torsion tube.